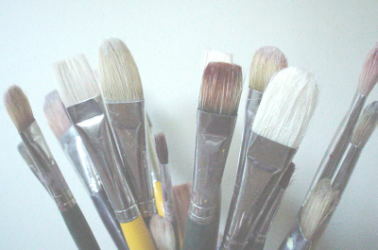 Cared for, oil painting brushes will last a long time. A little effort now will save you money and sweat later. When I started painting in oil, I ended up ruining some of my best brushes before I learned better. At the same time, I have also learned to keep solvents away from my skin as much as possible. So, here are some techniques I use to make my oil painting brushes last and safeguard my hands. I know this sounds odd, since you hold the brushes and generally don't touch the paint directly. If you're like me, however, no matter how careful you are, you will end up with paint and medium on your hands unless you take precautions. You want to minimize exposure to these chemicals as much as possible, because some of them can be absorbed through your skin. This is especially true if you are like some painters I know that use toxic solvents like turpentine and mineral spirits. When you wipe brushes, press or squeeze out the paint. Don't rub the brushes back and forth in the towel. I used to use rags made from old socks or other fabric I had lying around, but I switched to paper towels, because I found that the rags often left lint on my brushes. I recently learned of some good products for cleaning brushes. One is the Loew-Cornell brush cleaning pad; put the pad on the bottom of a jar, fill with solvent, and rub the brushes on the pad to help remove paint residue. Another approach is the Silicoil Brush Cleaning Tank. The tank has an aluminum coil in the bottom; when you wipe the brushes across the coil, it separates the bristles and rubs off the paint—very handy! Once you have used solvents to clean the paint off your brushes, you need to wash them with a mild soap under tepid running tepid water. Caution: don't use hot water thinking your brushes will get cleaner. The extreme heat from the water can break down the glue holding the bristles on the brush. Drying your brushes this way helps preserve them by ensuring that any drops of water fall away from the brushes, which keeps the wooden handles from rotting. If you have to pack them right away because you are traveling, then wrap the brush heads in a paper towel to keep their shapes intact—very important! Do you know that you can also clean your oil painting brushes with vegetable oils? I have found this an effective, economical, and non-toxic way to clean brushes. Using oils to dissolve oils is an ancient tradition in many cultures. In fact, many soaps use fats as cleansing agents (e.g. olive oil soap). If you want to avoid turpentine and mineral oil, or you want to condition and clean your brushes at the same time, give it a try. I also use a few drops of vegetable oil to clean my palette after I scrape off the left over paint with a painting knife. Use a paper towel and some vegetable oil to rub the remaining oil paint residue off your palette, and you are ready for the next painting session!